Some concerts don't really have any reason at all to happen. This one had, at a rough calculation, seven. First it marked the official launch of John Harle's new two-volume book The Saxophone - The Art of Playing and Performing (Faber Music - INTERVIEW). This has been a major undertaking, involving several years in the conceiving the and writing, some astute brokering by Leslie East, and a huge common effort by author and publisher. It is a mighty 336 pages of A4 in a solid case and has already received plaudits from Branford Marsalis and Tommy Smith. Second, it was also a celebration of Harle's sixtieth birthday, for which he arrived on stage proudly brandishing his newly-acquired Senior RailCard - and also sporting - as a reminder of human fallibility perhaps - a sprained ankle. That birthday is cause to reflect on the scale and heft of Harle's activity as player, producer, composer, and as instigator / commissioner of new works. Third, it also marked officially the appointment of John Harle FGSM ARCM (Hons) as Visiting Professor at Guildhall School. He was joined on stage for the encore, a speedy Albinoni Double Concerto movement by the impressive, and impressively relaxed fourth year student Tom Gimson. 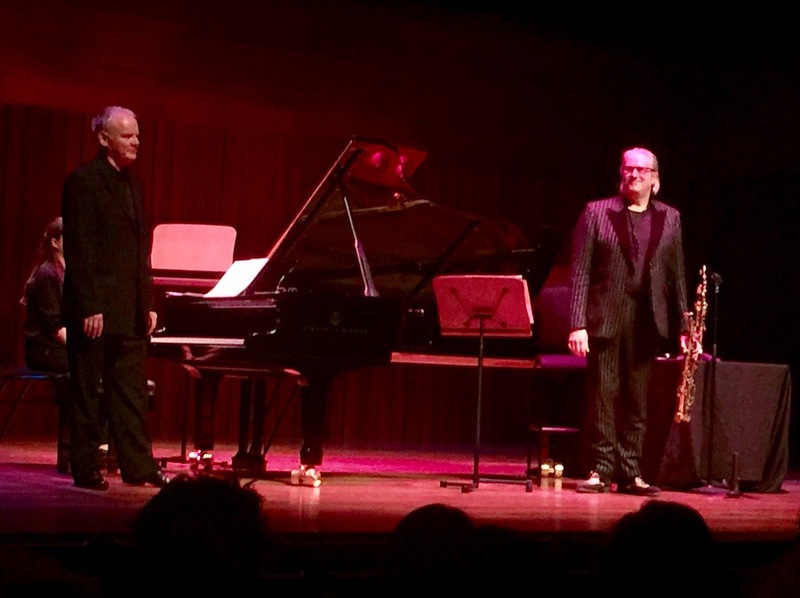 Fourth, it also presented the London premieres of a number of recently commissioned pieces, a reminder that Harle has been responsible for adding significantly to the repertoire for saxophone. The pieces were of very different character. The most openly appealing was a lyrical slowly evolving reverie by by Gavin Bryars. Perhaps the most elusive was Sally Beamish's piece based on a retrograde - more there than can possibly absorbed on one hearing. The new piece by Graham Fitkin was angular, motoric and reminiscent of Stravinsky's Agon. There was a highly effective Carl Davis piece based on an unreleased film by Charlie Chaplin about a flea circus, The Professor which traversed effectively from a sardonic Shostakovich-ish slow waltz to a helter-skelter Ibert scherzo. The most curious and experimental of the pieces was by the youngest of the composers Oliver Christophe Leith, whose Little Boy Fat Man and Other Baby Names (a reference to the nuclear bombs landed on Japan in 1945) featured a whole range of technical effects - microtones, cross-fingerings, sections in subtone, and flutter-tonguing. Fifth there was a reminder of Harle's work as composer first half closer- an extended feature of his new composition Arcadia, which is apparently on its way to growing into a full ballet. It brought on the subtle, distinctive violin playing of Chris Clad, and had sections recalling Bartok's Contrasts as well as an exuberant, even edgy excursion into English folk-rock. The seventh reason, and perhaps the part of the evening which will stay longest in the mind, was to hear Harle playing two alto features by Ellington written for Johnny Hodges, Star- Crossed Lovers from Such Sweet Thunder and Sultry Sunset.These pieces brought the opportunity for direct communication as the music stand was put to one side, the chance to bathe in the warmth of tone, impeccably judged shaping of phrases, Pure pleasure.